New Sportbikes and Race Bikes! Most of the time, manufacturers would rather claim it’s their bike, not their rider, that’s fast. 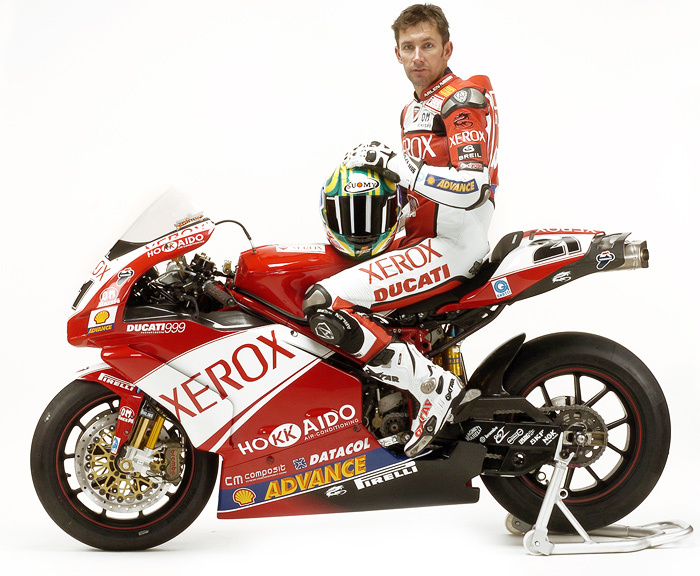 But last season, Ciabatti found himself arguing that Ducati’s Superbike was only about equal with the best fours, and that it was made to appear dominant because Troy Bayliss was riding the wheels off it. That claim rang truer after the final 2006 MotoGP race of the season at Valencia. Troy stood in for the Ducati MotoGP team's injured star-crossed Sete Gibernau and dominated Rossim, Hayden and the rest, becing the first rider to ever win both a World Superbike title and races, and a MotoGP race in the same season. 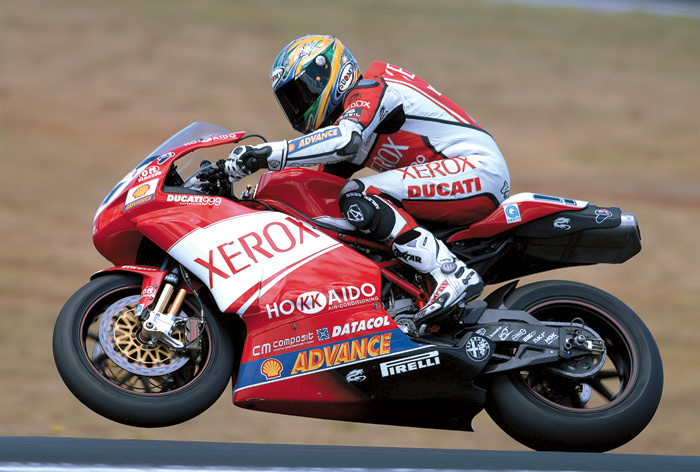 January 18, 2007 - Last week’s World Superbike test at Phillip Island ended with a Ducati 999 Superbike (in the hands of Troy Bayliss) a full second faster than the best of the four-cylinder machines. All in all, the 999 flies pretty well, for a lame Duc. Still, that’s what it is. The 999 is officially obsolete—replaced by the 1098. Not that long ago, the World Superbike Championship was derided as a Ducati spec series; half the grid was 998s. This year, the permanent entry list counts only two factory 999s and three privateers. Next year, Ducati won’t race or officially support the 999 at all. That means that unless the FIM and FGSport get together and allow twin-cylinder bikes larger than 1000ccs to compete, the 2008 World Superbike grid will not have any Ducatis. The series will, to say the least, be poorer for it. I called Paolo Ciabatti, the director of Ducati Corse, to try to get a little perspective on this situation. He’s made no secret of the fact that he’d like to see major Superbike rules from around the world brought into concordance (differences between AMA and FIM rules must bedevil all the manufacturers, so it seems hard to believe that notion is too controversial). But he’s also argued since ’02 or ’03 that twins should be allowed a 200cc displacement advantage. That takes some nerve, coming off a championship won on equal terms with Suzuki, Yamaha, Honda, et al. The thing is, terms (particularly financial terms, if you believe Ducati) haven’t been equal. While the World Superbike technical regulations for twins and fours are identical as far as chassis are concerned, there is considerably more latitude available to the twins in the motor department. According to Ciabatti, last year’s championship came down to three things: first, an engine fully developed at great expense to the limit of the more expansive (and expensive!) twins rules, relying on a lot of short-lived components. Second, a MotoGP-quality traction control system. And third, Troy Bayliss. Ducati would have preferred to race under consistent technical rules for fours, triples, and twins, with a progressive displacement advantage to keep overall horsepower roughly equal. There’s nothing revolutionary in this: World Supersport rules have long allowed a comparable displacement advantage for twins (Ducati 749s compete with the Japanese 600s). The new 1098 will also be eligible for the FIM 1000cc Superstock Cup in ’07, and in the British Superbike Championship in ’08. The increased displacement limit for twins was proposed in meetings of the MSMA (the manufacturer’s committee that interfaces with the FIM and series promoters) a few years ago, with the idea that equality/competitiveness would be fine tuned through the use of air restrictors. It was not accepted by the FIM or WSC promoters; they anticipated difficulties administering and monitoring such a system (despite the fact that it works acceptably in other disciplines, including NASCAR, where there’s big money on the line and rules interpretation is, to say the least, creative). For years, when the fastest and most agile fours were 750cc, Ducati could compete (and to be fair, may have had an advantage) with its 1000cc twins. But as the current generation of 1000cc fours came on the scene, the company found itself in a dilemma: it could continue racing literbikes (and winning as often as not, albeit at greater and greater expense) but gradually fall behind in the performance of its production bikes. Or, it could deliver the horsepower and torque that road-going customers demanded (by making the 1098) but forego the eligibility to race in World Superbike. I asked him if Ducati’s withdrawal from AMA Superbike racing had been a shot across World Superbikes’ bow—a warning that the Italians weren’t kidding about wanting rules changes. He denied that it was, and I believe him. The AMA’s rules are more restrictive than the FIM’s—for example, World Superbikes can run different primary gearing, lighter crankshafts, and a different throttle body. The American rules limitations made it even more expensive to be competitive here, and the absence of a Xerox-scale sponsorship made cutting and running a purely business decision. Troy Bayliss’ Phillip Island lap times on the 999 with Pirelli spec tires would be very competitive in MotoGP, and he slaughtered his WSC rivals at the January test. So why is Ducati asking for an extra 200cc? Well, the simple answer is that they’ve stopped making a one-liter Superbike. But the debate began several years ago, so there’s more to it than that. As any hot-rodder knows, there’s no replacement for displacement. Ducati felt that customers—influenced by dramatically improved four-cylinder literbikes—wanted more horsepower and torque than could be delivered by their trademark 1000cc twin. So they replaced the 999 with this beauty. If you want to see it in a Superbike race next season, you’ll probably have to move to England. Whether you’ll ever see it here, or in the World Superbike Championship, is yet to be determined. Anyone who’s seen My Cousin Vinny knows that Italians have a flair for arguing their cases. So, after talking to Paolo I called a Very Smart Guy to bounce a few of these ideas off him. My guy (who has his own reasons not to be seen as meddling with rules committees) has to remain anonymous. At first, he was pretty scornful of Ducati’s plea. “I think the Italians are going to have to cry a lot of crocodile tears if they’re going to get the rules changed. If they want people to take their claim that they need a displacement advantage seriously, they should stop lapping a second faster than the fours,” he said. What I wanted to get at, though, were engineering insights, not accounting ones. At that point, my Very Smart Guy drifted into some pretty arcane territory and I took notes as fast as I could. First, I asked him whether the heavier, U.S.-spec Superbike crank would significantly affect performance compared to the lighter World-spec item. He chuckled, “Crankshaft inertia is really complex.… It’s so much more than just numbers on dyno sheets.” He went on to speculate that one reason the relatively underpowered 999 twin was as fast as the fours was that the fours have more power than they can use, even with traction control. Superbike rules won’t allow the fours to cluster crank pulses the way twins naturally fire (and the way MotoGP bikes are set up, too). I asked him, wouldn’t a displacement advantage only reflect some kind of fundamental fairness? After all, AMA Formula Xtreme rules allow a variety of displacements, from 600cc fours to 1350cc air-cooled twins, but so far the bigger displacement bikes haven’t muscled aside the CBR600RRs and their ilk. As the Very Smart Guy warmed to his topic, my notes got pretty scribbly. “Piston Area” appears as a sentence fragment, as does “Piston Speed” and “BMEP.” Rather than stop him, I checked later to learn that stood for Brake Mean Effective Pressure. It’s tough to compare the relative effort/expense that Ducati puts into World Superbikes with its far larger (Big Four) rivals. (Ducati is a smaller company, even, than Kawasaki.) But even Ciabatti admits that virtually all Ducati produces are sport bikes, so racing promotes the full line and “saves” money that rivals having to spend money advertising scooters, cruisers, tykes’ bikes, and the like. No matter how you cut it, Ciabatti’s claim that it’s costing more and more to keep the 1000cc twins competitive seems to be supported by the trend among World Superbike privateers to trade customer Ducatis for kitted Japanese bikes. Ducati Corse employs 10 percent of all Ducati staff. That’s surely more than any of the Japanese companies. Since the death of Soichiro Honda, the Japanese have gone racing to sell motorcycles. If you’ve spent time in Bologna, you know that Ducati sells motorcycles in order to go racing. That’s why it’s hard to imagine World Superbikes without the booming twins. I know he’s right when he says that the other manufacturers should want Ducati to stay, too. In 2005, Suzuki’s championship meant a lot more because Ducati was there. I want to see Ducati stay in World Superbike racing (and come back to the AMA). That means devising a set of rules that allow 1200cc twins to compete with 1000cc fours. I’d rather not see different technical rules, a la BSB, for the different displacements. My first choice is to just to whack the 1200s in there and use time-honored techniques like ballast or restrictor plates to keep things fair if necessary. That’s me being a politician. Like all legislators, I’d talk a good game on fiscal restraint, so while I was printing new rules, to control costs for everyone, I’d make Superbike technical regs conform to the current Superstock regs. Then, I’d cut and paste current sports production rules under the Superstock heading. The fans wouldn’t notice a thing. But just for the sake of argument, here’s an alternative: First, I’d institute a spec fuel rule. I’d specify a blend that could be marketed as “environmentally advanced.” Then I’d say, “You can homologate bikes of any displacement you want, you just can’t burn more than15 liters of fuel per race.” Manufacturers would have maximum freedom to race any bikes they wanted, an incentive to develop new fuel efficient technologies, and the rule would be easy to police. It could even reduce our dependence on foreign oil. Now that would be quite a legacy for a lame Duc.